30 THE SHOP NOVEMBER 2018 W hat kind of person are you? If you are lost, do you stop and ask for directions or grab your smartphone and try to figure it out yourself? More than likely if you are the latter then you probably didn't get lost in the first place because you planned ahead and put the destination in your GPS. What about when you go to the store to grab some shop supplies and you can't find something? Are you more likely to just look for it on your own or find someone to help you? With today's technology and wealth of information at our fingertips, many people have become less verbally communicative. People are less likely to say hello or intro- duce themselves and instead stare at their phones as they walk by. 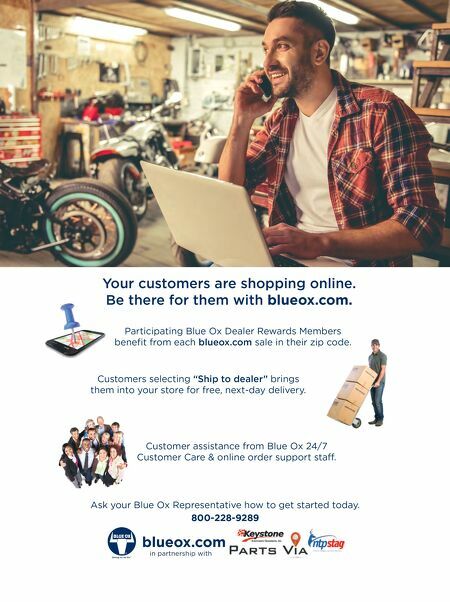 Add it all up and it's easy to see why many shop owners avoid doing something that could greatly benefit their business—ask for help. Why is it sometimes tough to ask for help? Like we said, maybe it's our desire to figure things out on our own. Or, maybe we want to prove to others we can handle things on our own. Regardless of why, it is a potential danger for those in authority to not ask for assis- tance when needed. Part of life—and part of being a good leader—is taking advice from those with more knowledge and experience. If we never ask for that advice—especially in our current society—there is a good chance it will never come our way. EXPERTS One great resource for advice is experts in the field related to what you are trying to accomplish. Think about it: you are an expert in your field. If someone has a question about a performance or restyling product, or what they should get done to their vehicle, they rely on your opinion and expertise to make the correct decision. In the same way, as a leader or business owner, you need to get an expert's opinion on how to handle a situation. For instance, if you are having an issue with your financials then you need to talk to a CPA. An agent can help with insurance questions. A professional contractor will have answers regarding questions about your shop's electrical, HVAC or other systems. Need Help? Just Ask! When it comes to business, no one needs to go it alone. By Josh Poulson 30 THE SHOP NOVEMBER 2018 In today's society it's easy to think you can solve every problem yourself. 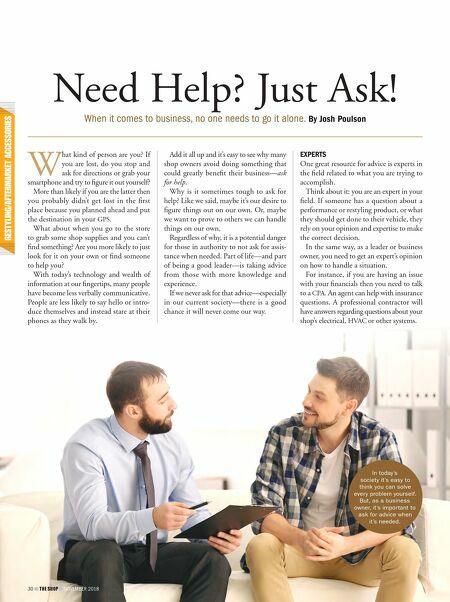 But, as a business owner, it's important to ask for advice when it's needed.